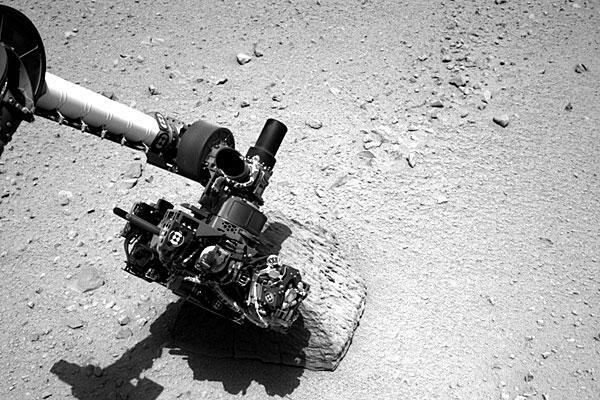 Curiosity touches its first Martian rock on September 22 (Credits: REUTERS/NASA/JPL-Caltech). As NASA celebrates the anniversary of its October 1, 1958 founding, questions are swirling about the agency’s future. Dealing with budget cuts that have gutted exploratory missions, juggling fickle political direction, and expecting more of the same, NASA’s future sometimes seems bleak despite its global stature as the premier space agency, the one that – back in the good old days – put the first man on the Moon. NASA’s exploration targets in recent years have been reduced greatly, with missions being sacrificed to keep a single bright spot alive: Mars. One way or another, NASA is doing its best to get to the red planet. The Curiosity mission has provided a needed infusion of energy for the agency and there’s no question that public support is at a high. NASA is doing everything it can to engage its fans, from instant image turnover to Twitter feeds for every rock Curiosity touches. But even Mars missions are getting axed as deeper and deeper budget cuts limit NASA’s ability to act. On September 25, a NASA working group released the Mars Program Planning Group (MPPG) report that makes yet another attempt at devising a dirt-cheap pathway to explore Mars. This one might actually be onto something. The group proposes a novel way to engage crewed missions and NASA’s involved-but-missionless Orion capsule and Space Launch System development programs in a cost effective robotic mission. The proposal calls for sending robotic vessels to Mars to collect geological samples. The samples would then be launched to a rendezvous point in space. Astronauts would go pick up the samples from the rendezvous point for further study. The MPPG proposal is an elegant way to solve a number of NASA’s problems. It gets a manned mission out of Earth orbit more quickly than most other proposals could manage. It gives those crews a forum for practicing for an eventual Mar mission. It retains public interest in Mars exploration the way only a manned mission can. And it addresses planetary protection concerns that might prevent a sample return mission from delivering its goods to Earth directly. So where will this plan go next? With NASA’s direction up for grabs as the United States works up to a presidential election, no one knows, the agency itself least of all.